Long-sightedness (also called far-sightedness or hyperopia) means someone can see things clearly in the distance, but has difficulty seeing close objects clearly. If you are long-sighted, there is a problem with how your eyes focus. Usually your eyes, especially the corneas and lenses, bend light to focus it onto the retina (the light sensitive layer at the back of the eye). Long-sightedness usually happens because your eyeballs are smaller than normal, or the front surface of your eye (the cornea) is too flat. This means that when your eyes are fully relaxed, light focuses behind the retinas rather than on them. This causes blurry vision. 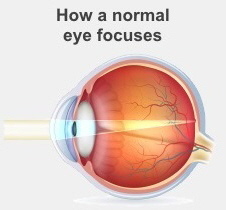 Normal eyes can see clearly in the distance, without using your eyes' focusing muscles to do so. Then as they look at closer objects they use the muscles that control the shape of the lens to focus. If you are long-sighted, you need to use your eye muscles to focus clearly in the distance. When you then try to look at something up close you have to put in the same effort as someone with normal eyes – but this is on top of the effort you are already putting in to see in the distance. Overall, your eyes have to work harder to see things clearly. If your eyes are just mildly long-sighted, they will probably focus without causing eyestrain or discomfort. However, if your eyes are more strongly long-sighted they will need to work harder to see things clearly – especially objects that are closer to you. Many young children are long-sighted, but because their eyes are much better at focusing they can still see at a distance and close up. However, the effort they have to put in to focus clearly might cause discomfort. Most adults develop another form of long-sightedness, called presbyopia, as they get older. It usually becomes noticeable after the age of 40.